As I was taking the shot little Miss Emma spotted a squirrel and began the chase! I think maybe she was happy about the crocus-fest and she couldn't contain her enthusiasm! Well, she did trample a few of them. how beautiful. I love fields of violets too. a nice bonus to your home. What a delightful surprise! Driving to work yesterday I encountered an entire field of daffodils - it was the same kind of thing you experienced. So lovely. I love how your kitty is running through the shot. Great photo! Oh, how lovely! I've missed some awesome posts lately....have a great day! Now that's a lovely lawn surprise. Much better than bare spots or trash or hidden junk! Lo, what a BEE-utiful surprise for you! You know how I adore those colours! It will be fun to see what pops up in your yard next! What a beautiful scene, Emma must've had blast! HAW! Oh how absolutely delight to look out and see this spring surpise. I loved seeing what would come up naturally when we first moved here. but its still a surprise when I plant something and it comes up, because you forget what you planted where by the time spring comes along again. Thanks for sharing. wish it had been a bit bigger photo to see. What a wonderful spring surprise. It looks gorgeous! I also wonder what else will pop us. Anyone that leaves blooms like that has more surprises I 'm sure. lololo, i am looking out behind all those stones in the back. i planted some jelly beans inbetween all those crocuses and i hope emma doesn't eat them. let me know if they grow and i will share them with you. Oh wow what a nice surprise your garden had in store for you!!!! So much fun to see what else will show up! When I came home today from my painting afternoon a surprise from you was waiting for me! Wonderful to come home like that!!!! What a beautiful sight. So uplifting. Oh, that's just gorgeous - I love that about new places - hopefully there'll be lots more nice surprises. Being in these warmer climes means I haven't seen crocuses for years! I adore those kissing rabbits you've got there. And what a big girl your Miss Emma is!! What lovely treasures Mother Nature leaves us...I think this spring, especially, there will be more gentle surprises than you can ever imagine...Beloved angels have a way of doing that! 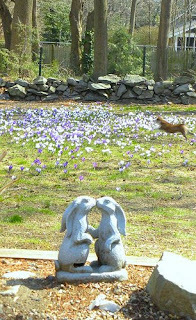 what a wonderful way to start the day especially seeing those kissing bunnies too (are they yours)? What a nice surprise! I love it when new things pop up in the garden that I didn't remember from last year. How fun that this is a new garden for you. Show us more surprises. It will be exciting seeing what all mysterious things appear at your new place. Your Emma is adorable,,and the crocus,,just amazing. Ahhhh, spring (in one's step too, that's obvious!). There was a house in the town where I used to live that had their whole front lawn planted with crocuses, so long before the grass started growing, it was a mass of blooms. I used to drive out of my way just to see it.